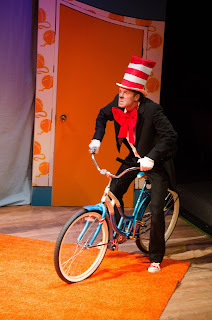 Once upon a time I went to a show and it was called The Cat in the Hat. 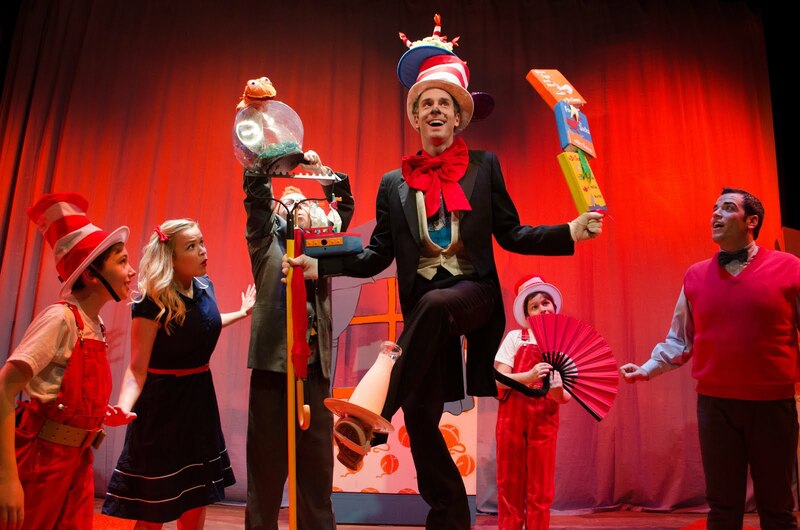 The Cat in the Hat is a play based on a book by Dr. Seuss about Sally (Giselle Vaughn) and a Boy (Michael Richardson) who sit in the house because it is raining and the Cat in the Hat (Danny Taylor) comes in and wants to have some fun. A Fish (Erik Strebig) wants to prevent any fun from happening. And there are two Things (Liam Dahlborn and Lily Dahlborn) who are trying to tear the house apart, but they want to have fun, so you kind of like them. I really liked that this show was very true to the book. Kids' theaters sometimes add in a bunch of extra stupid junk. I really liked some of the props (designed by D.J. Reed), and some of the props I thought could have been better. I am going to tell you about a few of them. I thought the kites should be real kites, instead they were just foam or cardboard wrapped around a stick. I think that they could have actually gotten real kites and taped them to a really thin cardboard pole in the back. I really liked the fish pot. I thought it was really funny when the Fish spit at the cat and the Cat blew him out of the pot. I really liked the bike because it was a real bike, and I thought it was nice that they used the real thing and not just a fake version. I also really liked the cushion seat that the Cat sat on and made music with. I wish that the fish (designed by Ken Sprouls) had looked a little bit more like the book, but I still liked the fish puppet's actor. If they had just changed the color to pink I would have been more happy because then it would have looked more like it did in the book. I really liked how the body looked kind of like in the book, but just the color of the fish is what I didn't like. I really liked it when the fish was dreaming because I knew a lot of those songs and also how the Fish was like lip-synching any song that had to do with the sea. Like "Sail Away" and "Part of Your World," the Ariel song. I really liked when the actor was doing cool tricks like a cartwheel. It was really fun. I thought that he was really persistent like the fish was, and he did a really good job pretending to be like the Fish. The Boy and the Girl are kind of like the storytellers of the story, but it is mostly the boy in the book and the play. I really liked Sally saying stuff in the show, being another narrator, because in the book it is just the boy narrating. I thought it was nice how they were really hyper because the ages it was aimed at would really like that. I thought that Thing One and Thing Two were really cute and their laughing was super adorable. It reminded me of what a 5-year-old kid is like in a toy store. They were really really excited and running around everywhere, like hyperventilating basically. I thought the Cat in the Hat was really funny. There was a part where he kept throwing up different balls, and it came down as a really giant one and he was like "uh" and then he had to give the ball to the boy because it was so heavy. I thought it was really cool how the Cat kept playing music on the tennis racket. Like he played an Irish jig and everybody Irish danced. And also he made rock music with the tennis racket, and everybody was like "Yeah!" Usually, in the t.v. 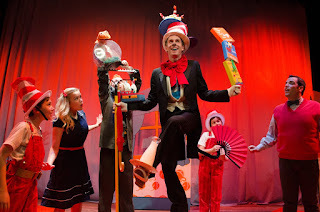 show, the Cat in the Hat is like "I'm so jolly! I'm so jolly!" But here he had a kind of a twist. That twist was that he wasn't so jolly; you felt like he might mess up your house. Sometimes he was a little silly, but he wasn't trying to be totally like for little kids. He was trying to make people who were older also like it, and he succeeded with that by making me like the show. They say that this is about responsibility, but I don't really think so. I think it is about having fun and cleaning up after yourself. The show should not end on the note that this show is all about being responsible. "Have fun" is basically the moral of the story but also using your imagination. The Fish represents responsibility and he doesn't want them to have any fun because he doesn't want them to do anything that is not normal or make a mess. The Cat represents fun. But he is not completely irresponsible. He wants them to have fun in a kind of destructive way and use their imaginations, but then he cleans up after himself. People who would like this show are people who like Dr. Seuss, striped hats, and bossy fish. I think this show is for ages 3 and up because it is very interactive and The Cat in the Hat is a book that young kids are probably familiar with. People should go see this show because it is funny and a truthful adaptation of the book. Once upon a time I went to a show and it was called Buddy: The Buddy Holly Story. And it was about Buddy Holly's life and his music. There are three concerts in this play. I think they spent so much time showing concerts because it is about a great singer and guitar player and they wanted people to see what he was actually like in his live concerts. The play shows a bunch of recording sessions too because Buddy Holly and the Crickets made a lot of records. Then you get to know about how they recorded the songs and the fights they had. It shows you that it wasn't always easy to make their own music. Sometimes they had fights and sometimes they were very happy doing their work. I loved the show because I never really knew about Buddy Holly's life; I just knew who he was. I loved it because it is such a good experience because even if you are not a musician, you put yourself in the place of Buddy Holly (Andy Christopher) and you kind of get to know what it feels like to be a musician and how you could get engaged to a girl in 5 hours. I thought it was really funny how Buddy Holly's mom kept calling the record studio on their telephone and embarrassing him by asking "Has he eaten yet?" He knows that he has to eat at some point--he is almost a grown man--because otherwise he would just starve. It shows that he really cares about music; he loves his job so he tries to do the best at his job. He is going to eat at some point probably in the day, but his mom thinks that he will never eat because he cares too much about his music. One of the first places that they go to make records is at Decca Records. They have a fight about Peggy Sue when the actual song is called Cindy Lou. The drummer (Joe Cosmo Cogen) has a girlfriend whose name is Peggy Sue, so he wanted to change it to Peggy Sue. He thinks that then his girlfriend will marry him and she does. I think it was kind of right to change the name, but it kind of wasn't. It was right because he made the drummer's girlfriend marry him. But Peggy Sue should have married because she loved him, not because they changed the name of the song. My favorite song by Buddy Holly is "Everyday." And it goes something like this: "Everyday, is-a getting closer. Running faster, than a roller coaster. Love like this will surely go my way. A-hay! A-hay! A-hay a-hay a-hay!" I loved seeing how it was recorded with the celeste, which sounds like a baby piano. Not a baby grand piano but a baby piano. It sounded like a high-pitched ding. Vi (Carrie A. Johnson), the wife of the recording studio guy Norman Petty (Eric Scott Anthony), played the celeste which I thought was nice because it is mostly about the boys and having that one girl in the band is kind of nice I think. I thought that was important because it shows that the wife of a guy who records these guys can actually do something to a song and make it sound better in a band that is all boys. There is a very fun part where a singer at The Apollo (Lacretta Nicole) sang "Shout." It doesn't have an exclamation point--but it should! It was fun because Lacretta was such a great singer and I really loved her singing "Shout" because that character seemed very rousing and a hyper character. One of my other favorite things in The Apollo was the bass player (Sam Weber) doing all those cool tricks on his bass--like climbing up on the bass, playing the bass on his back, and playing his bass while he is on top of the bass. They show the scene in The Apollo because The Apollo was an all African-American theater but Buddy Holly and the Crickets are white. So then they are worried that they won't like them, but they love them actually. Buddy Holly was not a racist even though lots of people were racists back then. There is a really beautiful and sad scene--now I am already getting teary--and it was between Buddy Holly and his wife Maria Elena (Noellia Hernandez) who he decided to marry after he'd known her five hours. She was having a bad dream about Buddy Holly dying in a plane crash. Sounds familiar, doesn't it? And he thinks that "I'm not going to dies in a plane crash." He is not being sarcastic; I'm being sarcastic. I am being sarcastic because he should have listened to his wife and then they could have had a happy ending and he would die when he was 96. Seriously, the wifes are always right when they have dreams. Like Macbeth's wife is right. Julius Caesar's wife is right. Listen to your wives! Geez. He sang this song called "True Love Ways," and it made her feel better, but it shouldn't have. He does this song in their house before he goes on his tour where he dies on the plane. I was happy that they got to have that moment together, but I was also sad because I knew what was going to happen soon and that this was the last time she was ever going to see him again. The "Chantilly Lace" song which was by the Big Bopper (Ryan G. Dunkin) made me feel a little uncomfortable. There were a bunch of guys on one side and a bunch of girls on the other side. And all the boys were kind of saying romantic stuff to the girls. And it made me feel a little uncomfortable because it was kind of like they were talking to me romantically. Being me, I think that when people are talking in a song, they might be talking to me. All that he really cares about is that his girlfriend is pretty. He doesn't seem to care about what kind of work she does, if she is strong, if she's nice, if she's talented, or if she likes him. Richie Valens (Ryan Jagru) is a guy who likes to do Elvis moves and likes ladies. He likes doing all that shaking and hip rolling, and he mostly does that to the ladies. And he dies at age 17. I know that seems kind of old, but it actually isn't. He's not even in his twenties. He is on tour with Buddy Holly, and they are also very good friends. His famous song is La Bamba which is a famous song that I know on my violin. It is a fast song in Spanish. I really like it because it is fast and really poppy. There is a song that I love that is called "Johnny B. Goode." It was their end song, and I have memorized all the verses. They chose that song to sing at the end because it is a song that everybody knows and that everybody could sing along and dance and clap to. You leave the theatre thinking about them being dead, but you also leave the theatre feeling kind of happy because the ending wasn't very sad; it was them singing La Bamba and Johnny B. Goode. It makes me feel good that they had such a good last concert, but it also makes me feel sad that that was their last concert. They would probably all be alive now if it wasn't for that stupid plane. People who would like this show are people who like concerts, love songs, and getting engaged after five hours. I really liked the show because it is funny, touching, and it lets you get to know Buddy Holly even though he is not alive anymore. This show closes in a week, so hurry up and go see it! Once upon a time I went to an interview and it was with Akash Chopra. 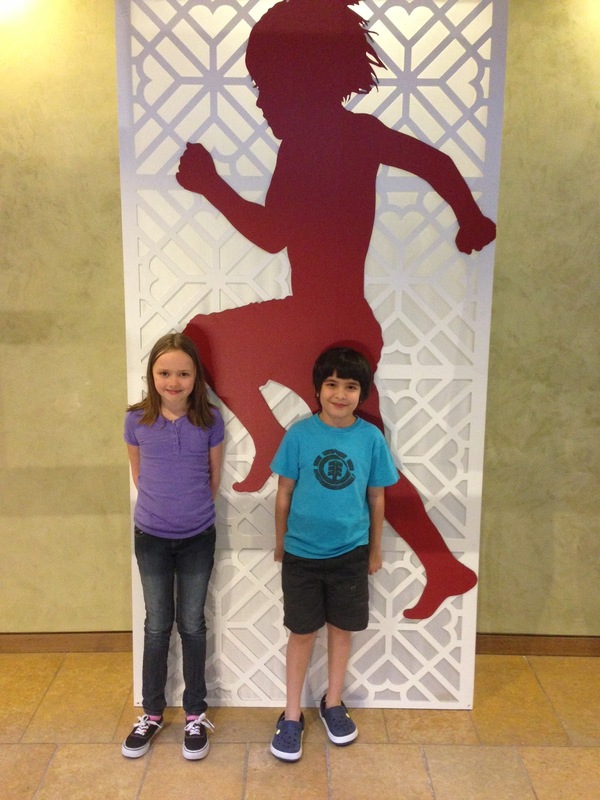 He is 10 years old and he is doing the play The Jungle Book at The Goodman, playing the role of Mowgli. I went upstairs to the lounge and I met him there. We had lunch from Potbelly's and I did an interview that I am about to tell you about. This was a great new experience for me because I have never interviewed anyone before. He is from England and he currently is located in New York. He was born in Singapore. He has stayed in many different places, so traveling not a new thing for him. I asked him what he liked about Chicago. He said, "What I really like about Chicago is it's basically like New York and it's just such a fun place and I love the pizza!" He misses his family because he only came with his dad, so he misses his sister and his brothers and his mom. So he does miss his family, but he really likes Chicago and he likes how The Goodman asked him to do this project. This is his first professional experience. He has also done Les Miserables with Kidz Theater in New York where he played Gavroche. And he also did Schoolhouse Rock! at the same place. I can see what he likes to do--which is musical theater. It was also really cool that he mentioned he had only been dancing for 6 months when everybody else in The Jungle Book has been dancing for their entire lives. I can understand that he feels like this is the hardest thing he has to do in the Jungle Book! I asked him what he thought about the movie and the book The Jungle Book. He had never read the book, but he loves the movie: "I think it is a really nice and sweet movie about Mowgli as a kid." He likes playing the part because "he is an amazing fun character." I was wondering how this play would be different from the movie and the book, and he said, it is some of both: "I like about [this show] that they added a bit of the Rudyard Kipling and the movie and they didn't just put the movie or Rudyard Kipling." I am going to go see The Jungle Book on opening night, July 1st. You guys should go see it too and you will get to see this great kid that I interviewed. I'm going to be writing a review of it when I see the play!